Stafford Beer, the inventor of the VSM described it as a “holistic model involving the intricate interactions of five identifiable but not separate subsystems”. The model was developed during the 1950s while Beer was a manager in the steel industry in Sheffield (UK) as a practical tool capable of dealing with issues of organisational structure. 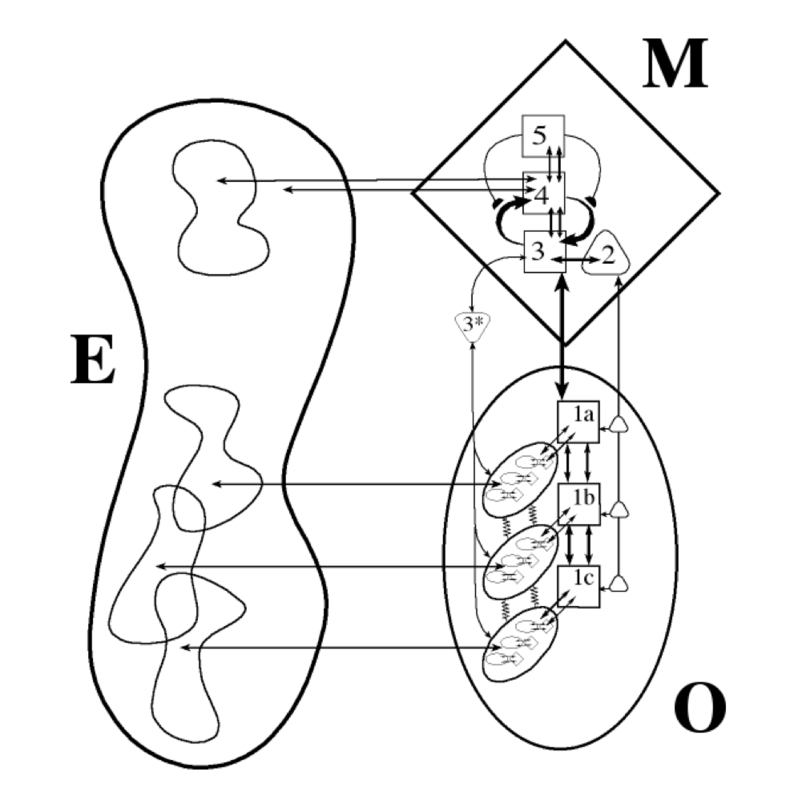 The VSM is firmly grounded in systems theory and is inspired by the way the brain co-ordinates the muscles and organs, Its theoretical basis is Ashby’s work, particularly the Law of Requisite Variety, Weiner’s development of cybernetics, the mathematics of recursive systems, and McCulloch’s theories of neural networks. What emerges from all of this is a body of knowledge which describes the way that all viable systems work. Beer identified the invariances which apply universally, regardless of the size or nature of the viable system. It has been applied at all scales from small work-groups to nation states. Beer’s first models were mathematical, but these proved impossible for most people to understand. He then designed the graphical model which illustrates the five subsystems (the building blocks of the VSM) and the “intricate interactions” which connect them. The diagram also shows the interactions between the viable system and its environment – the niche within which it operates. The diagram shows the three main elements : the operation (O) , the management (M) and the environment (E). As can be seen, the operational ellipse is composed of three operational units (labelled 1a, 1b, and 1c) and the management diamond is composed of four sub-systems (labelled 2, 3 4 and 4.) These are the five systems: the operation is System 1 – in this case composed of three operational elements – and the management is composed of Systems 2, 3, 4 and 5. The various arrows represent the many and often highly complex interactions between the five systems and the environment. System 2 deals with the inevitable problems which emerge as a number of autonomous, self-organising operational parts interact. There will be conflicts of interest which must be resolved. System 2 is there to harmonise the interactions, to keep the peace, to deal with the problems. Without a System 2, the system would shake itself to pieces. System 3 is concerned with synergy. It looks at the entire interacting cluster of operational units from its meta-systemic perspective and considers ways to maximise its effectiveness through collaboration. System 3 ensures the whole system works better than the operational parts working in isolation. Beer talks about an “explosion of potential” which emerges from collaboration and symbiotic relationships. Without a System 3 this could not happen. System 4 ensures the whole system can adapt to a rapidly changing and sometimes hostile environment. It scans the outside world in which it operates, looks for threats and opportunities, undertakes research and simulations, and proposes plans to guide the system through the various possible pathways it could follow. Without a System 4, the system would be unable to cope with the complexity of the external environment in which it operates. Without a System 5, fragmentation would be inevitable. The operational units are given as much autonomy as possible so they can respond quickly and effectively. This is limited only by the requirements of system cohesion. Systems 1, 2 and 3 between them make up the internal environment of the viable system – the Inside and Now. The autonomous parts function in a harmonising internal environment which maximises its effectiveness through creating mutually supportive relationships. System 4 is concerned with the Outside and Then. It formulates plans in the context of both the outside world and its intense interaction with System 3 which ensures all plans are grounded in the knowledge of the capabilities of the organisation. System 5 monitors the interaction between S3 and S4 to ensure all plans are within policy guidelines. If not, it steps in and applies its ultimate authority. All parts of the system work together holistically. Information is designed to flow throughout the structure in real-time, binding together the various sub-systems. Applications involve re-thinking the workings of any organisation in these terms. Take any enterprise and identify the operational parts: this is System 1. How do conflicts of interest get resolved ? This is System 2. As the process continues a diagram something like the figure shown above will develop. Once this is complete, the diagnosis can begin: are the identified systems properly connected ? Are they fit for purpose ? And so on. After 50 years, no-one has been able to find a case study in which the VSM has failed: in all its many and varied applications it has provided insightful diagnosis and has directed organisational restructuring to create effective organisations, based on individual autonomy and creativity.